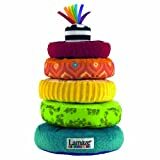 I love that this stacking toy is made out of material and not plastic so I know when my little one puts it in her mouth there won’t be an issue with questionable plastics. It is great quality and each ring has a different texture/ color. I even machine washed and dryed it even though it reads ‘surface clean only’ and it was fine. I bought this toy for our vision impaired baby. The colors are bright and bold and there are different textures. We typically use the rings as individual toys (baby is 3 months old) but anticipate him being able to stack it in the future. My daughter absolutely LOVES these stacking rings. They are vibrant and each ring has a different feel for sensory development. She loves knocking it over and they are all soft so I don’t worry with her chewing or throwing the rings. Highly recommended!